I think people who have read about crazy zero-tolerance policies and teachers and school administrators going to jail would think I was talking about public schools. But no, the teacher organizations in Texas think that being able to choose your children’s schools—and remove them with no state pushback would mean that the school faces no accountability. That not having the government to bail them out would mean financial mismanagement. And that due process is even necessary when all you have to do is say “you have no authority over my child”. I heard all of this during the Texas Senate Committee on Education’s public testimony hearing on school choice programs. Truly one of the pillars of Texas government is the institution of education. Parents should have the choice to send their children to private or parochial schools but not with public monies. … the debate over vouchers during previous legislative sessions has moved approaches into parallel discussions over other privatization policy issues such as tax-credit scholarships, equal opportunity scholarships, parent trigger laws, home rule charter districts, and charter school expansions. Choice, senators, is a farce when the choice is a bad one. And the issue is one of control, as well. These groups see that government schools control parents and students, and think that somehow a private institution that has no power will exercise the same control. [The Latino Education Task Force Agenda] rejects a diversion of public funds to schools unaccountable to publicly-elected governing boards, or to schools who do not have to meet the special needs of all students in Texas but rather can choose their own students. All a consumer has to do is choose, because in a consumer-driven economy the producers and sellers chase consumers, not the other way around. Private and religious schools are not required to provide students with the same level of educational service and support as they are guaranteed in public schools. For example, private[sic] schools follow outside laws that protect students with special needs. There is a substantial evidence from numerous long-term studies that vouchers of any kind do not raise student achievements, evidence of mismanagement has been reported in states around the country that have created tax credit tuition programs and concerns have been raised about the lack of public accountability as well as the failure of private schools to serve all students’ needs. It’s as if they think that since local governments favor schools with lopsided administrations, that parents will, too, ignoring teacher quality, cost, and the school’s record with students. Finally, Rhonda Stanton of The Arc of Texas (4:36–4:38) appears to have no idea what the word “choice” even means. The Arc of Texas cannot support any school choice program that does not guarantee the student’s right to a free appropriate public education under the Individuals with Disabilities Education Act. We’ve heard several people refer to this today, and I just wanted to reiterate that some of the things that you would be losing when you take public school dollars and provide them to a private school/public school choice programs would be you would lose the opportunity to have an individual education program, you would lose the opportunity to be in a least-restrictive environment, you would lose the opportunity to require transition planning and services, to provide instruction by highly-qualified teachers to ensure that students receive supplementary services or appropriate related services including transportation. And most importantly parents would lose their due process rights. We do realize that many parents in special education do have less power, I would say, than the rest of the parents in that school and that they don’t necessarily feel empowered in a systemic way to change things in their school and so there are some things that some schools do that are best practices that we could look at such as having local special-ed parent advisory committees, having parent liaisons, having local IEP facilitation, which we passed last session, parent surveys, parent training, inclusion on district and campus improvement teams, if there were representatives. So there’s a lot of things we can do to hopefully empower parents and give them more say so in what happens in their schools. Rather than empower parents by letting them choose their school, or even choose to band together to create their own custom school, the Arc of Texas recommends more committees and meetings. Public schools have a very tough time with special needs kids, precisely because they are a one-size-fits-all system. The school must fit everyone. And the reason that public schools must be a one-size-fits-all is that all students are required to go to them unless they opt-out. That private schools don’t have to cater to a one-size-fits-all scheme is an advantage for parents: they can choose the school that best fits their children. Choice also means that when scandals happen at a school, parents can choose to send their children to a different school. They don’t need to penetrate layers of administrative shields to transfer their children. Most of the problems with the single-government-school model stem from them being the only choice for most people, due to people having to pay taxes to fund the school and then only being able to use those taxes in one place. The reason public schools need something like the legal system’s due process is that they are the only choice. A private school isn’t going to suspend your child for pointing his fingers at another classmate because they need that customer. If they kick that child out they also lose that money. Public schools can apply crazy zero tolerance rules because it doesn’t cost them anything. And if a private school does start going crazy, you can take your child out immediately. A private school isn’t going to send law enforcement to your home to force you to send your child back. When it comes to holding public schools accountable, organizations against choice are against that, too. They don’t even like testing public schools. 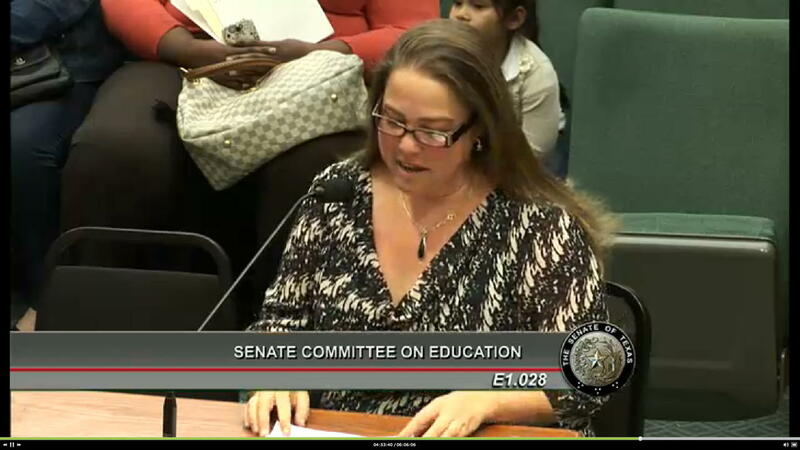 Immediately following Stanton’s testimony, Matt Prewett of the Texas Parents Union (4:41–4:43) declared that standardized testing should never be used to hold schools accountable, only students. That is, the data should not be used in aggregate, but rather only to apply to each individual. Individual student, of course, not individual teacher. Let me be very clear here. Standardized test scores should be used for assessing students, not public schools. Standardized test scores should be used primarily to empower parents, students, and administrators. Number three. [sic—there was no “Number one” or “Number two”.] If annual standardized testing doesn’t directly benefit the students taking the test, then the classes and the test need to be redesigned. Semester-long classes, for example, or using competency-based testing to assess the students. If students don’t do well on the test, then it’s the test’s fault. Tests should make no judgements or criticisms. They should only give happy, empowering thoughts. There was also some discussion about ways to improve the choices parents have even under one-government-school systems, such as “parent trigger”, where, if a school does poorly the parents can force a change in administration. The Texas Classroom Teachers Association does not want to protect the status quo. That is not our job, and it is not what we aim for. We do care about the children and all that goes with it. But I wanted to mention—I’m specifically going to talk about Parent Trigger today. It’s a little bit sad to see some of the same, old, tired arguments made against school choice that were made against charter schools. That they’ll cream the best students, and in fact they haven’t. And neither would private schools. The students that tend to leave a public school are the ones that are unhappy there. Either because they’re not doing well academically, or they’re being bullied or threatened or something like that, that destroys their ability to learn. It’s not which system is better. We’re not here arguing for the teams, I’m for school choice for all. I applaud the public school choice programs. There are some great magnet schools. Sometimes the public schools say “we have to educate everyone”. Well, they don’t do it all the same way. They have magnet schools, they have alternative education programs, they have disability, they have gifted and talented, they’ve recognized that one size doesn’t fit all. They just can’t do a good job of educating every student. We have half the campuses that are failing academically acceptable. Do we call for closing public schools? We have an El Paso superintendent who’s in jail for financial mismanagement and fraudulently falsifying the test scores because when you put pressure from the top down you get pressure to falsify documents, to look good for the state. So what I’m here to argue for is consumer empowerment. Parent empowerment. When you give the parent control over where their share of state funding is going, public or private, you change the incentive system of the entire structure. There is that sense in which Matt Prewett is correct. Having government use test scores to pressure schools from the top down means that administrators (who are, after all, administering the tests) can pass on corruption by administrators, who need to pass those tests to get paid. When the government pressures itself to do better, far too often what you get is corruption. The pressure we need is from the bottom up. It’s a lot harder to falsify student achievement to the parent who sees that student every day. That alone is a good reason for allowing parents to choose how they spend their share of school money. In response to Texas 2014: News and Stuff about Texas and the Austin-Round Rock Metropolitan Area in 2014. Average private school tuition in Texas is $7,901. David Goldhill, inspired by the unnecessary death of his father in a hospital surrounded by great doctors, nurses, and technology, describes in detail why health care today kills people—and then charges for it. In no other industry could a business fail so miserably, and then send a bill for having failed. He also argues persuasively that the ACA took all the bad parts of our health care system—and made them worse. 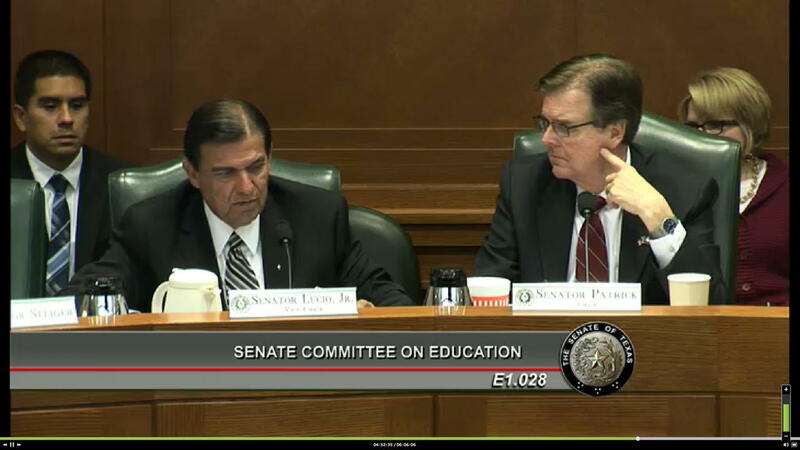 The web page of the Texas Senate Committee on Education. Is Trump calling the bluff of establishment Republicans? By appointing Republicans who have promised to reduce government into the very areas they’ve promised to depower, is Trump calling the establishment’s bluff? Democrats endorse public school elections, teacher recalls? Should legislators and teachers be evaluated for job performance in the same way? A group called Winning Democrats suggests that public school teachers should be elected positions rather than tenured, and that teachers should be subject to recall by the communities they serve. Why not support government unions? You support NFL unions! Either teachers unions don’t understand the difference between the private and public sectors, or they want to force us to pay for NFL season tickets regardless of whether we watch football. What is a captive audience, anyway? G.K. Chesterton writes, in Eugenics and Other Evils, that whenever someone starts asking “what is x anyway?” you know they’re trying to pull some wool over your eyes and make it the default. So, really, what is a captive audience, anyway? The most important reform is the reform that makes the reformer obsolete. Americans United for the Synchronization of Church and State, a little-known right-wing organization dedicated to government-run schools, made a heartfelt plea this week to block school choice. “Otherwise, who knows what might be taught in schools?” asked AUSCS Executive Director Barry W. Lynn. Oregon white privilege conference says blacks, hispanics best-suited for taking orders from white masters, as they are unable to make decisions for themselves, think for themselves, and achieve success without direction. Bad teachers provide an immense service to this country. You don’t see private industry firing bad workers. The best companies are the ones that have the most bad workers. Government cheese is government cheese, whether it’s a poor food product, poor housing, or poor education. This tiny little bookshop and coffeehouse is worth stopping at if you’re on Highway 79 and need a browse, a coffee, or a shake. Does Hurricane Harvey support socialism in Texas? Should Texas forego federal assistance because Texans dislike socialism? If you’re looking for a day trip to get you out of the house now that spring is here, why not drive up (or down) I-35 and visit some small bookstores between Round Rock and Waco? TXU was once the government-sponsored monopoly energy provider in Texas. They just went bankrupt, apparently because they expected a free market to act like a government market. Texas is considering open carry—yes, that’s right, the great and wild state of Texas is not one of the forty-four states that allow open carry! In a state that already has concealed carry, self-defense opponents need a new spin on their arguments that carrying will cause a bloodbath. Texas school choice last modified December 17th, 2014.